And you get confused by all the instruments on your automobile's dashboard? Muahaha. The F-117 is the world’s first operational stealth aircraft. Through a combination of faceted surfaces, advanced materials, and other technologies, the Nighthawk is virtually undetectable to radar. With precision weapons, the F-117 can destroy heavily defended, high-value targets with impunity. Essentially designed by electrical engineers, the F-117 is inherently unstable and stays airborne through a sophisticated flight control system. 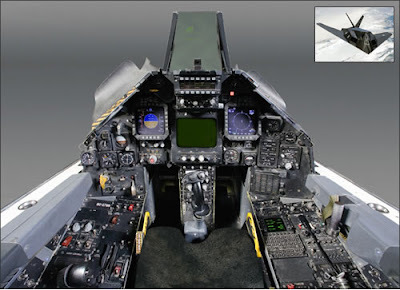 The original cockpit design used many off-the-shelf components, such as F/A-18 displays. A complete set of standby flight instruments is included as a backup. Plastic glareshield extensions are used to minimize instrument reflections on the flat canopy side panes. More photos at the link provided by Neatorama. Confession: I often steal without remorse from Neatorama, but I see it as advertising the site. Such Is how rationality works. * Don't laugh, aircraft manufacturers already have changed to the term "flight deck". I'm guessing most pilots haven't.